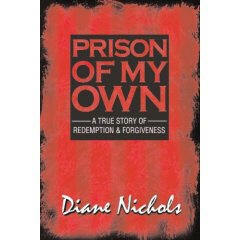 The heroine of Prison Of My Own was happily married for thirteen years, had two children and a perfect marriage. Then one day her husband murdered his nineteen year old mistress. Oops. Mind boggling! I could not for an instant imagine how she could forgive him. Can you? I squirmed just thinking about it. Then, I had to know. Even more I had to understand the hows, the whys, and the whats. The Hows. How could she not have known he was having an affair? How did she find out? How did he redeem himself? The Whys. Why was he having an affair? Why did he kill his mistress? Why did she forgive him? The Whats. What about their kids? What’s next for her? Can this marriage be saved? Should it? Ms. Nichol’s book is far from depressing. It is a surprising, inspiring and courageous work in progress, just like her life. I snuggled up to it every night for a week. I cried with her, rooted for her, for them. I bite my nails, dared to hope and cried some more. I grew to love her husband, John. I hoped she would too and cheered when they remarried. Prison Of My Own is an awakening. It is an intimate journey that just gets better and better. It will leave you, as it did me, waiting for a sequel. And, hoping Diane will share that with us too. What A Dog Loves! and Producer of The Fatigue Be Gone! Recovery Guide Series.